A total of 28 centers in 17 states have been threatened on Wednesday. At least two Bay Area law enforcement agencies investigated bomb threats made Wednesday at a Jewish Community Center in Marin County and at a Jewish school in Foster City, in a troubling phenomenon that appeared to be happening all over the country. Marla Cohen, communications manager for the New-York based, JCC Association of North America said that 28 centers in 17 states were threatened in total on Wednesday. That count did not include the Ronald C. Wornick Jewish Day School in San Mateo County, which was deemed safe about lunchtime. Last week, there were 16 JCCs threatened in nine states. She said some of the threats came in as robo-dialers and some were actual people. Last week, the FBI was called in, she said. The Anti Defamation League said the threats did not appear "credible," and listed the states where the centers were targeted: New York, New Jersey, Ohio, Florida, Massachusetts, Maryland, Michigan, Minnesota, Delaware, Connecticut, Alabama, California, Maine, Tennessee, South Carolina, Missouri, Texas and Kansas. The fear in San Rafael, California lasted about two hours at the campus at 200 North San Pedro Road. The property is a hub of Jewish life, and includes Rodef Shalom synagogue, Brandeis Jewish Day School and the JCC, a popular exercise and community center. 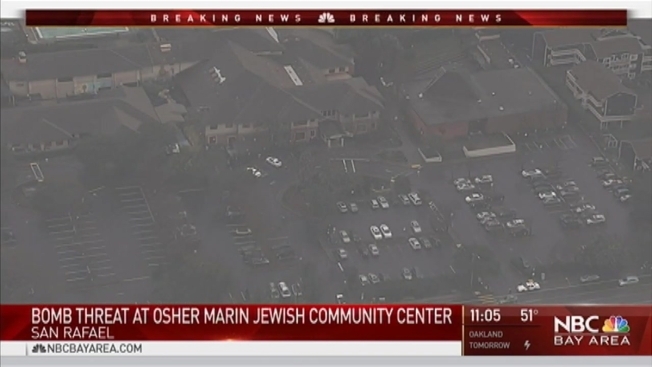 Osher Marin JCC spokeswoman Iris Lax told NBC Bay Area the center was given the all-clear about 11:45 a.m. She said this was the first time this JCC had ever received a bomb threat and it's also the first time this JCC ever had to evacuate. "Thankfully, nothing substantial happened," she said, adding that her staff drove some people home and many others went across the street to a school to stay safe and warm. The JCC's preschool remained closed for the day. "It's unfortunate that JCCs are being targeted. We're a community center that helps so many people. We don't want anyone to be concerned about their safety." Marin County Sheriff's Lt. Doug Pittman said the first call came in about 8:45 a.m. and deputies are now working to identify where it was made and who made it. Molly Jo Rosen, who works at Kol Shofar synagogue in nearby Tiburon, said she spoke to the sheriff's department, who told her the threat was an automated call with a generic-sounding computer voice. In Foster City, police received a call around 8:45 a.m. about a bomb threat targeted at the Ronald C. Wornick Jewish Day School on Foster City Boulevard. The school was evacuated while police and a San Mateo County bomb squad investigated. Police said nothing suspicious was found after an exhaustive search of the campus. The school was given an all-clear at about 11:30 a.m. The threats, rippling across the country, all on the same day and following similar threats last week, were certainly not welcome, despite the fact that there have been no reports of injuries. It's unclear if and how the threats are related. "We don’t know what’s going on. There are a lot of unknowns," said Jeremy Russell, of the Jewish Community Relations Council in San Francisco. "We are very concerned about the existence of these calls and the literal threat they are imposing on the community. We will be responding appropriately." In Miami, police responded to reports of a bomb threat at the Miami Beach Jewish Community Center. Threats were called in at the same center a week ago. Jewish community centers in Scotch Plains, New Jersey, and two in Connecticut, one at the JCC of Greater New Haven in Woodbridge and another at The Mandell JCC West Hartford, reported receiving bomb threats. That site was deemed clear later Wednesday morning. And then last week, threats were made to at least seven JCCs in Florida, New Jersey, Delaware, Tennessee and North Carolina. It's unclear if the threats are connected. "I think this is the world we now live in," Rosen said. "There will be threats to religious organizations and we'll see it skewed toward certain religions more than others." NBC Bay Area's John Zuchelli, Gonzo Rojas and Shawn Murphy, along with other NBC Universal stations contributed to this report.